OK, so your camaro is probably worth a tad more than a free pizza, but today you can show off your camaro and score a free large!! 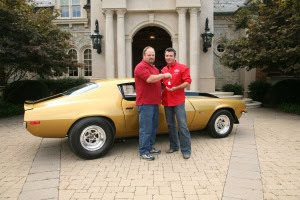 In celebration of “Papa John” finding his long-lost camaro, he is giving all camaro owner’s one free large pizza — today only!! This offer is good only on carry-out orders…but hey….you get to drive your ride to go and get it. As on all offers like this, you will want to call ahead to be sure your location is honoring this deal.